Critics of active management have come by their skepticism honestly. The average active manager’s track record against a stated benchmark speaks to the market’s efficiency, and the difficulty of adding value to passive alternatives. The problem may lie in the conventional active manager’s approach. Creating a better forecast of a company’s earnings and finding mispriced stocks has proved a fleeting skill for a few managers, and impossible for most. We believe a better opportunity to outperform the market comes instead from anticipating investor behavior. In the following pages, we explain how behavioral biases shape the expectations around a company and ultimately influence its stock price. These biases often lead to a predictable pattern of how investor expectations will evolve and offer a rare opportunity to capture alpha in an otherwise efficient market. A stock’s price embodies the collective wisdom of the crowd … but also the biased expectations of a few. If the former is true, identifying the latter may be one of a very few sources of alpha in an otherwise efficient market. Unlike many active investors, we don’t dispute one of the basic tenets of the Efficient Market Hypothesis: A stock price reflects all the relevant and available information investors have at their disposal to project a company’s future cash flows. When new information comes to the fore that changes those projections, stock prices simultaneously reflect it. At any moment in time then, a stock price embodies a company’s consensus forecast, determined by an entire industry long on CFAs, PhDs and a host of other impressive designations. Most active investors have approached this framework with hubris. They attempt to outperform the market by creating and acting on company forecasts they believe will prove superior to Wall Street’s consensus. That model has come under attack lately from fiduciaries and financial media alike. Their skepticism is well earned: As of the first half of 2016, 94.58% of U.S. active managers underperformed their benchmarks over the last five years¹. The statistics over longer time horizons are similarly bleak and paint a stark picture about an investor’s ability to create superior earnings forecasts. Even though the market’s ability to reflect knowable information has made forecasting a perilous task, we believe there is still a market inefficiency that investors can arbitrage. That inefficiency stems from a faulty premise underpinning the Efficient Market Hypothesis: that investors behave rationally. Investment decisions are complex and uncertain, and even the most sophisticated investors are influenced by heuristics, cognitive factors and emotions that introduce irrational, behavioral biases into their expectations about a company. Those biases often lead to a predictable pattern of how future expectations will evolve. If investors can predict how these biases will shape future expectations, then they may be able to capture excess alpha as the market responds to changing perceptions. And as it turns out, a narrow subset of experts provides a guidepost to where expectations will likely head. A stock price reflects the consensus expectations for a company. The consensus view is largely distilled from Wall Street analysts, whose expectations are transparent in the form of publicly available earnings estimates. Revisions to those estimates demonstrate how an analyst’s expectations are shifting and can be used to project future expectations. But that information is only valuable to the extent that the rest of the market follows those expectations. Our research shows that the broad market follows Wall Street analysts’ expectations closely. Since we started measuring the impact of analysts’ earnings revisions on stock prices in 2003, we’ve found a single revision has had an average 35 basis point impact on the stock’s price. This research removes the impact of medium- and short-term momentum, market capitalization, earnings reports and aggregate sector influences that could affect a stock price. The chart below highlights the market’s reaction to changes in analyst forecasts. The bar on the left shows the stock performance of companies that reported the largest earnings surprises over the given time period, while the bar in the middle shows the performance of companies that had the largest upward analyst earnings revisions. One might expect that extremely positive earnings announcements have the largest influence on stock prices. Not so. Certainly, stock prices move higher when an earnings surprise is announced, but reactions to analysts’ estimate revisions are demonstrably larger. Wall Street analysts’ influence on market expectations is not that surprising; humans are hardwired to adopt the advice and follow the opinions of perceived experts. In any field, be it health care, academia, politics or finance, we feel more comfortable when our views align with people we perceive as most knowledgeable. But here’s what’s interesting: Wall Street analysts fall prey to behavioral biases of their own. Those biases stem from the arduous task in front of them. That behavioral biases affect Wall Street analysts’ expectations is no slight on their intelligence. Analysts as a group are highly educated, diligent, well connected and extremely insightful. They are asked, however, to perform a remarkably difficult task—one that doesn’t fit well within the confines of human decision making. The human mind works quite well within linear parameters. We can take a single piece of information, or take the outputs from a single task or variable and correctly use that single output as the input into the next step of a sequential process. However, humans struggle with simultaneously assessing many variables and in turn, developing probabilistically accurate forecasts. Analysts must consider all the geopolitical, macroeconomic, industry- and company-specific factors that could influence a company’s earnings, assign a range of probabilities to those variables and then combine and weight each variable properly to create a comprehensive model that will accurately forecast a company’s revenues, costs, and, ultimately, profits. The task is complex, and fraught with opportunities for behavioral bias and persistent forecasting errors. Interestingly, the digital economy may be making analysts less certain about their expectations, allowing behavioral biases to hold even greater sway. The number of earnings estimate revisions has leapt 87% since 2003. The growth comes at a time when Wall Street, and presumably the number of Wall Street analysts, is shrinking. The change agent? Technology has made it easier for analysts to revise, publish and redistribute their new expectations. This creates a feedback loop that reinforces uncertainty, and begets one of the more common behavioral biases: herding. As one analyst observes peers changing their expectations, uncertainty regarding the individual’s own forecast increases, potentially resulting in a forecast change by that analyst, which in turn could lead to changes by additional analysts following the same stock. As the ability to quickly disseminate earnings forecasts becomes easier, the only certainty seems to be more uncertainty. Traditional financial theory is predicated on a well-intended notion: that investors behave rationally. The rational investor presumably maximizes profits, possesses complete knowledge and undertakes action that is consistent with his or her economic well-being. However, a growing body of behavioral finance research over the last 40 years suggests that humans have cognitive limitations that often result in seemingly irrational decisions. A host of biases, heuristics and emotional factors guide our thinking, often leading to sub-optimal outcomes. These impediments affect the most novice and the most professional investors alike. 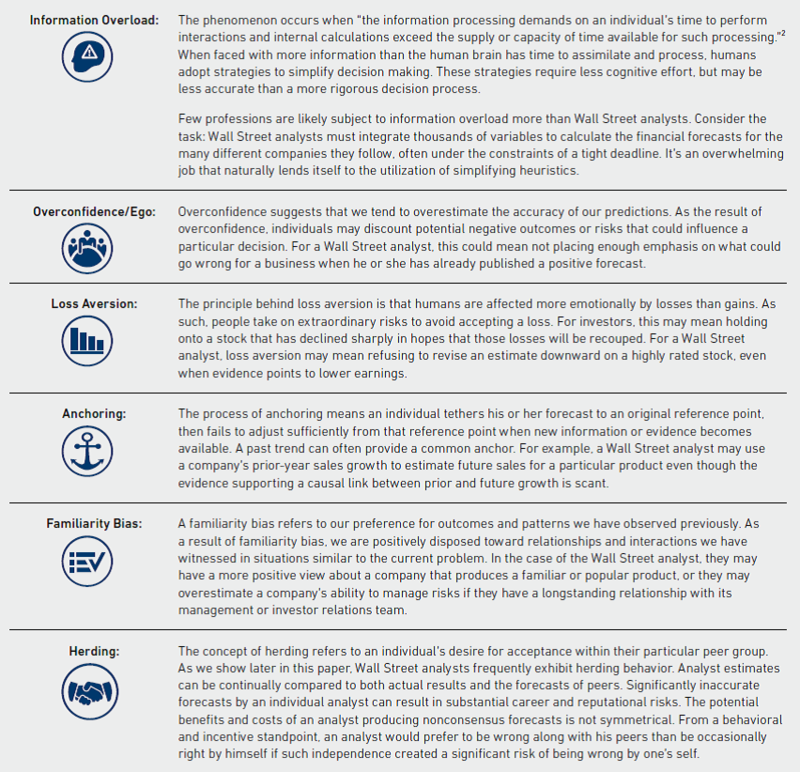 Below is a primer on common behavioral finance concepts that can affect decision making, and how they may influence Wall Street analysts. Thus far, we’ve shown how Wall Street analysts drive the market’s expectation about a company, and in turn, its stock price. We’ve also explained how and why behavioral biases creep into a Wall Street analyst’s expectations. The material question for investors, however, is whether analysts’ biases and heuristics result in predictable behavior about their future forecasts. The serial correlation of their forecasts suggests a significant level of predictability. If behavioral biases don’t influence analysts, one would not expect serial correlation in their estimates from one period to the next. If analyst forecasts are efficient in an economic sense, then macroeconomic, industry-relative and security-specific events that affect a company should be randomly positive or negative relative to prior expectations. As such, earnings estimates based purely on new economic and industry data should not exhibit serial correlation between a prior estimate and the next; analysts are just as likely to receive new information that would lower the next estimate as they are to receive information that would raise it. But if behavioral biases affect their expectations, for example if an analyst over-emphasizes more recent information or is influenced by the forecasts of other professional analysts, one might expect serial correlation in their estimates. The two charts below examine serial correlation in analyst behavior. 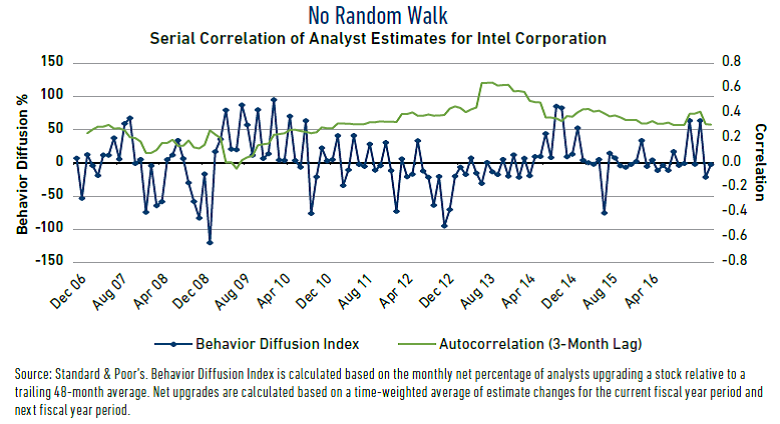 The first chart examines serial correlation of behavior at the individual stock level, using Intel Corporation as an example. The dots on the blue line indicate the net percentage of analysts who either raised or lowered their earnings-per-share forecasts for Intel each month. At first glance, the variation between dots would suggest the analysts’ estimate changes are random, influenced solely by new economic or company-specific information. Some months, nearly 100% of analysts revised their estimates up. 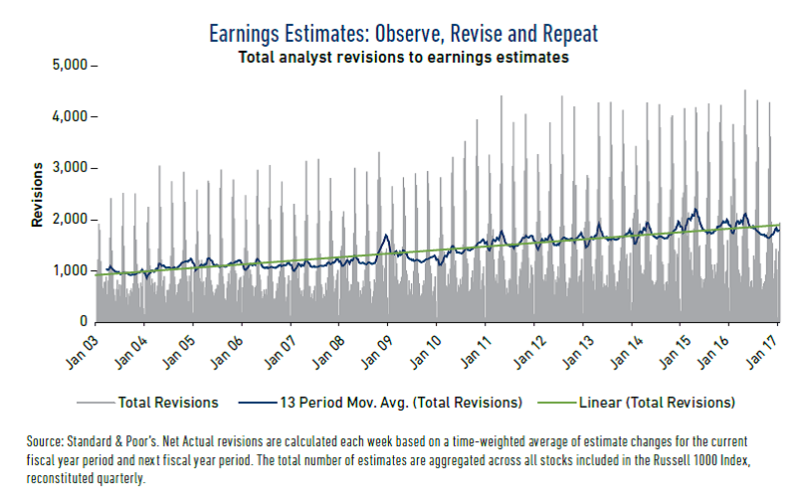 In the following month, a large percentage of analysts might revise earnings down. Indeed, analysts do respond to new information in the market. If, for example, Intel announced a defective product or a macroeconomic report points to less microprocessor demand in the coming months, an analyst will incorporate that information into a new earnings estimate. The variation in blue dots captures these instant reactions. The green line, however, suggests that beneath the monthly fluctuations in earnings forecasts, a pattern of serial correlation exists. The line represents the serial correlation between the analyst’s current forecast and the forecast three months prior over a rolling four-year period. A degree of serial correlation exists in every period except the height of the Financial Crisis. Over the course of the 10-year study, the average serial correlation was 0.3. This means that in the case of Intel, the analysts’ prior earnings forecasts did indeed give an indication of how they would revise their earnings forecasts in the future. Intel is only one stock. The next chart shows how many stocks within the Russell 1000 Index have exhibited a high level of serial correlation in analysts’ earnings estimates. Serial correlation has not been observed in the earnings forecasts of every stock. However, as of November 2016, 74% of companies in the test universe exhibited positive serial correlation in behavior, and for nearly half of these companies the degree of correlation in their earnings forecasts was high enough that we can say with 95% confidence that the results were not due to random variation. At times over the past decade, as much as 60% of stocks in the index have exhibited this high level of serial correlation. The portion of stocks exhibiting this statistically significant level of serial correlation has never dipped below 40% over the period tested. Even though the behavioral biases of analysts lead to significant predictability about their future expectations, the market has done a poor job of pricing in these evolving expectations. The inability to account for those biases presents a rare inefficiency in a market that is otherwise ruthlessly efficient at pricing changes in stock-specific characteristics. The chart below demonstrates this inefficiency, and the value of predicting analyst behavior over time. The chart encapsulates the average price movement of a stock on the day analysts revise their earnings forecasts for a company, and the price movement for the 120 days afterward. 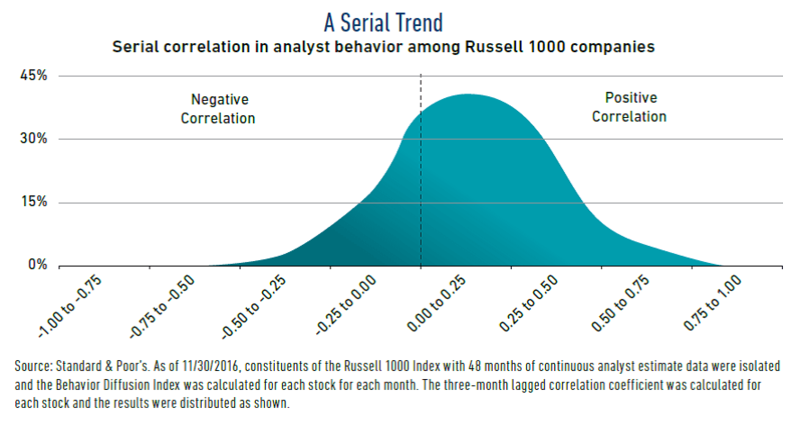 The data for this model includes every instance in which more than 10% of the analysts covering a given stock in the Russell 1000 revised their earnings forecasts upward or downward (which we refer to as a positive or negative “behavioral event”) over the 2010 to 2015 study period. As expected, stocks experience a notable rise or fall the day of the positive or negative behavioral event. The drift upward in the months after a positive behavioral event (and downward after a negative one) demonstrates the serial correlation inherent in analysts’ behavior, and the market’s failure to fully account for the embedded information in these forecast changes. After one positive behavioral event, there is a tendency for more positive forecast changes to follow as individual analysts influence the behavior of other analysts following the same security. Similarly, after a negative behavioral event, more negative forecast changes tend to follow. Contrary to what one would expect in a completely efficient market, prices persistently drift in the same direction as the prior behavioral event. 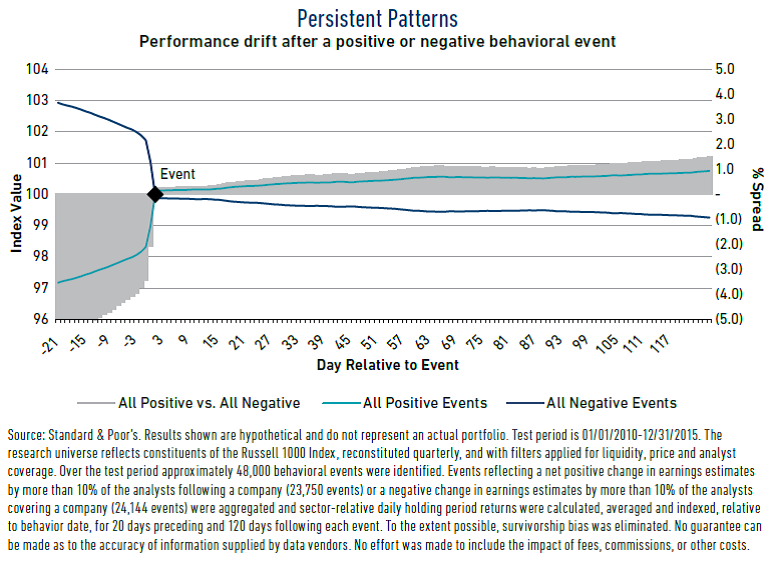 Investors appear to view each behavioral event as an isolated occurrence, driving the stock higher (or lower) each time a new positive (or negative) behavioral event takes place. If there was no serial correlation in analysts’ behavior, or if the market correctly priced the predictable components of analyst behavioral events, stocks would not demonstrate an upward trend in price appreciation in the months following a positive behavioral event. The market’s inability to account for analysts’ behavior creates an opportunity for investors: A strategy of purchasing stocks with observed positive analyst behavior may provide excess abnormal returns as subsequent behavior exhibits predictable herding characteristics. We’re uncertain about the ability of active managers to consistently create superior forecasts relative to consensus estimates already incorporated into stock prices. A better approach to active management may be to acknowledge uncertainty. Thousands of variables can affect a company’s earnings, and no one can say with conviction what cash flows might be one, two or even three years into the future. Faced with the Herculean task of crafting an estimate that incorporates so many variables, Wall Street analysts, like all of us, are influenced by a myriad of heuristics and cognitive factors that introduce behavioral biases into their expectations and forecasts. The result: demonstrable herding characteristics and serial correlation in analysts’ estimates. While herding behavior and other biases often lead to a level of predictability in Wall Street analysts’ future expectations for many companies, the market often fails to price this information efficiently. Instead, stock prices tend to move higher following a significant earnings forecast revision upward, as if each revision was an uncorrelated event. We believe predicting the positive trends of influential security analysts is a more reliable way to add alpha than attempting to out-forecast the market with respect to which companies will experience earnings superior to the collective estimate implied in their stock prices. The traditional approach to active management has let investors down. Few, if any, managers can consistently forecast a company’s earnings more accurately than the collective forecast implied in a stock price. Anticipating investor behavior may provide a better approach to outperforming the market. Behavioral biases influence even the most expert investors, and often create a predictable pattern of how future company expectations could evolve. If investors can predict how these biases will shape future expectations, they may be able to capture alpha as the market responds to changing perceptions. ¹ SPIVA (Standard Poor’s Index Versus Active) U.S. Scorecard, as of 06/30/2016. ² A.G. Schick, L.A. Gordon, and S. Haka, “Information Overload: A Temporal Approach,” Accounting, Organi¬zations and Society, vol. 15, no. 3, 1990, pp. 199–220.